The pictures are an awesome idea, especially when you are dealing with international foods. Great sense of humor by the way – chopsticks are the only way to go! lol! Have you had the chance to go to any Korean Restaurants? My brother spent a year in Seoul Korea studying Tae Kwon Do and came back with a new found appreciation for their cuisine. Like you said, not what people would expect. Keep up the great work, both here and of course, on the field. You are doing a fantastic job in all aspects of your game right now, and the group from Inside the Dodgers are so very proud of your performance so far this year – statistics don’t lie. We wish you and all of our beloved Dodgers all the best on this very long road trip. Also, just so you know, I attend a lot of Oakland A’s games (closer than Dodger Stadium), and they definitely know who you are, and they can only dream of having you in their outfield now. You were mentioned in surrounding company both from A’s fans and Angels fans. The Angels fans around us were talking about your home run off of Saunders, which I saw in person – very cool. Wow! I’m impressed. I’m also hungry all of a sudden. You have obviously done some things in your life other than BP. Nice review, and I’m sure it’s gonna be hard to get a table there for a while. Keep ’em coming, Andre. And don’t let the media knuckleheads get you and your pals down. We fans know who you are and how well you’re doing. HAH! I KNEW YOU WERE OVER HERE!!!! Wow Andre! I’m so hungry after reading this and looking at the pictures! haha! I love all the detail you put into it! this place sounds great! like Debbie^ said, all of us fans are proud of how well you’ve done this year so far so keep it up!! every time I go to a game and the announcer says “now batting #16 Andre Ethier!” the crowd goes crazy!!! (especially all the girls) haha so keep it up cause we all love you guys and wish you all the best!! thanks again for this review and keep them coming!! if you’re looking for some good thai food – check out the sapp coffeeshop on hollywood blvd in thai town. its got some really interesting food choices! again, thanks – and Go Dodgers!!! Hey Andre, sorry I left you off my handle. It’s the same one I use at Insidethedodgers.mlglogs.com. I guess I could be martinloneykempethierbillzbroxtondewittlarochekerhshawhudelwyn, but that just sounds a little too long. Haha. I’d like to recommend USA Ribs in Burbank, about 15 minutes (depending on traffic of course) from the stadium. With all due respect to Lucille’s — a very good chain — USA Ribs is in a league of its own!! Thanks again for your blog and thanks for talking to the “powers-that-be” to put a link to your blog on the Dodger homepage. We love your play on the field; keep it up! Like what was mentioned before, you are truly loved by many Dodger fans! I absolutely love going to the “not so nice looking” places as well, because they always have the best food. There’s nothing better than great food, it clears the soul. LA has so many great places, and i cant wait to see your opinions on some in the area. Keep up the good work, both on and off the field. Welcome to MLBlogs Andre! Keep up the good work ! oooh …. as much as I don’t like sushi … you actually make shabu shabu sound very appetizing. While reading this, I kept thinking about Mongolian barbeque … which I’m sure you’d love since you’re a meat-lover like me … hope to hear a Mongolian BBQ place you’d recommend. My favorite one is out in Monterey Park or somewhere like that. I don’t know where it is … but I used to go there with my mom, my uncle, and my uncle’s kids. LOL I just googled it to try and find it … found an Uncle Andre’s BBQ instead! What about dim sum and pho?? Can’t wait to read what’s next! You seriously need to become a critic on Iron Chef. I need to 2nd jub’s comment. You could definitely be a judge on Iron Chef. My husband (who works in the industry – sorry don’t live in LA or I would recommend) read your article, and the way you use your culinary terms makes you much more than just an ordinary home cook. It sounds like you have had some culinary training, and you could easily have your own show on the food channel. During the off season, they should hire you to do this for television. Like I said on your first post, you could honestly be the male version of Rachael Ray, and you would have one heck of a following. You have the terminology and the humor to be an exellent television personality for this industry that never goes away. Andre! This is really cool what you are doing. I’m a big Dodger fan, and I’m a big foodie, I actually have my own restaurant review site at http://www.eatinoc.com for places I visit in Orange County. I’m going to add a link to your site from mine, because I really just think it’s cool that a Dodger is showing this much interest in doing something like this. Keep up the great work and keep fighting the good fight. Take Care! This is so wonderful that you and the Dodgers are working with the Homeless missions. . I commute in a combination bus/train from the San Gabriel valley to the San Fernando valley. As I get off the bus at Alameda and walk to take the train at Union Station, I encounter a lot of homeless. One particular man I used to see sleeps by the entrance of the freeway with his shopping cart close by but there are so many more I see when I walk from Union Station to Broadway and Sunset to take the bus to the stadium. It breaks my heart to see so many homeless especially women with children. One morning I had stopped at the Women’s rest-room at Union Station and noticed a homeless woman there applying wet paper towels to her bruises on her face. From the train, you can see so many homeless living in the outskirts of the train tracks. Some of these people pick up discarded daily bus passes so that they can take naps on the busses late at night. They are so sleep deprived. My friend Eric and I went to Colorado for the last Dodger series. We noticed that the Rockies were having a 5K to benefit the homeless. We were commenting at the time that it would be nice if the Dodgers got involved to help the homeless in L.A. so we are very glad that you and the Dodgers are doing this. One of the things I do is collect the sample toilettes offered at hotels and donate them to homeless missions. I started doing this a few years back when a friend and I went to Vero Beach and she mentioned that she did that. When I was serving Jury Duty in Los Angeles, our group would go to Chinatown for lunch and we had them packed the leftovers to give away to any homeless we encountered along the way. While being in New Orleans for a conference, I mentioned this to my co-workers so we packed leftovers from Emeryl’s restaurant and the person receiving it was very thankful. Has anyone here read any of Steve Lopez columns in the L.A. Times about the homeless? He has written a book called “The Soloist” based on a homeless musician that Steve gets to know. It is soon going to be made into a movie. Keep up the good work Dr. Dre! You will get two tickets to the game on July 12th, Fireworks night! I will be volunteering at the Pasadena location. Versailles is one of my favorite places too. I used to work in WLA so we used to go there often. Overland is the street that comes to my mind but I think is just close to there. yum, yum. making me hungry and I had a big breakfast on the train with my commute friends this morning. I wish I lived down in so-cal so I can help out with the many causes you are involved in. I am involved with similar things here where I live. I am on the missions team at my church, and through them I work with an organization that helps people connect to local churches for financial assistance including budgeting classes and housing – our local Rescue Mission. I am hoping this year to go back to Mississippi to continue efforts over there as well. I am very impressed with all the things you do Emma, sounds wonderful. Andre sure has done a great job in getting these two things launched (Dining with Dre and the Rescue Mission), and it’s brought a whole new dimension to this Dodger team we so dearly care about. What does your buddy, Russell, think of Japanese food? wow, this review was amazing! i am definitely going to have to go check out this place.. i think josh rawitch told us that you were typing up the review on your phone, which makes you even more remarkable. thanks for doing this for us! you’re an amazing ball player, and obviously an amazing person as well! there’s another kind of hole in the wall place that i LOVE. it’s a Ramen place in j-town called DAIKOKUYA (not the kind you make at home for $0.40, haha). seriously, there is a wait almost every time i go there (mostly because there aren’t very many seats/tables) but also because it is SO yummy! one of the games i went to they had a profile of kuroda on the big screen and it says that his favorite food is ramen. maybe you guys can go together! I was seriously surprised to see you and Takashi sit at the table next to us that night at Shabu Hachi! It was interesting to see not only you at a Shabu-shabu restaurant with Takashi, but also when both of you were watching the Dodger’s game on TV…! I love shabu-shabu too. I’m glad that you like it too. Good luck with the rest of the season! Not sure if you read your blog daily, but if you do, those of us over at Inside the Dodgers wish you and the rest of our Beloved Dodgers the best in tonight’s game against the Tigers. Things just didn’t go your guys’ way yesterday(especially those two hits you had – you got robbed! ), but we are confident that you will be the rising stars very, very soon. There’s a lot of baseball left, so keep up the fabulous work, and we will be watching tonight. Just one non-baseball, non-food question: Are you part oriental? The reason why I ask is because I’m Japanese (no, not from Japan-born in CA, I’m the 3rd generation of my family in CA) but have seen people who are half Japanese, half Caucasian. I’m thinking you are, but are you? Such a great review. I definitely want to try that restaurant out. I can’t wait for more reviews. GO DODGERS! I’m gonna have to try this restaurant soon! It’s good to find out about restaurants in in the area. Thanks man! I am very impressed with the attention to detail in your review. Great job. Japanese and Chinese food are 2 of my favorites. I have a friend that really likes Thai food and she loves this restaurant called The King and I in Beverly Hills. I’ve been there a few times and it is good. Their address is 272 S La Cienega Blvd, Beverly Hills 90211. I also love PF Chang’s for Chinese food. I’ve been a Dodger fan for many years and you are one of my all time favorite players. Keep the faith and keep up the good work. I know I speak for a lot of Dodger fans when I say I hope you will be a Dodger for many years to come. Congratulations to you and Maggie on your pending parenthood. I look forward to more of your restaurant reviews. Now I know what blog to go on just before dinner. Although I live 3000 miles from LA, I can still get an appetite. If you remember that little old grey hair fellow in a blue Dodger T-shirt with an LA cap, outside Shea Stadium that Saturday, May 31th, when you came out to join your family. I didn’t know it was your family and both of us were suprised when I shook your hand. after I got your autograph and took your picture. I yelled, “Good Luck Andre” when I was leaving and you said “Thank You”. Then I asked you to ,”score some runs”, you looked like you didn’t understand what I said. I haven’t gotten to watch any of the games from this series until today, but during the telecast today, the Detroit announcers had nothing but wonderful things to say about you. Throughout the telecast whenever you were up, they brought up your career from being a 13 year old kid, your days as a high school ball player at St. Mary’s, your collegiate career with ASU(along with your teammates there), and now how well you are now doing with the Dodgers. In the last few series’ on the road, the announcers have not been too complimentary of the Dodgers in general, and it was just nice to hear some positive things said about the Dodgers from opposing announcers. Many positive things were said about some of the other Dodgers, also, but since this is your blog, I thought I would let you know. Great home run on Saturday!! There was a fellow Inside the Dodgers blogger there to see it. He said it was awesome!! BTW – can’t wait for the next review. We are coming out to Southern California to see the Dodgers/Braves series, and we would love to try a couple restaurants that you recommend. Shabu Hachi will be a definite. since you are a meat lover, I got two words for you: KOREAN BBQ! Andre, I like the post. Longer than the average blog post, and it looks like it probably took you a while. Hope to hear more soon, even if it does mean shorter posts. And in August when you’re in DC, there’s a 24 hr Korean place that looks like a cowboy bar just inside the beltway in Virginia that I’d recommend. Huge Dodger fan from Brooklyn here. Great review, have you tried the restaurant right next door to Taka? Tlapazola Grill… right next door is amazing for Mexican seafood. If Taka is crowded… try it, you will not be disappointed. The salmon vegetable roll is dynamite, and they have some awesome seafood specials, great mole’ and …. super margaritas! check out home.earthlink.net/foodsnobs for some of my reviews. By the way… best hamburgers in L.A. are at “Indulge Cafe” at Pico and Redondo in Los Angeles. Nice food review. Back in college I’d driven past this place before. I’m curious to see what you think of some of the Little Tokyo area places. Stay positive- a lot of us are rooting for you and want you to get a solid starting spot! Enough of this rotating in and out of the lineup business. Good to see a Phoenix local and an ASU athlete make it big with my favorite ballclub. I know this is your restaurant blog, but I had to come over here from ITD and tell you how fabulous you have been playing lately, both offensively and defensively. You are very much valued over at the Inside the Dodgers blog site, and we are pulling for you all the way, along with the rest of this young Dodger team. Keep up the terrific work that you have been doing all season, both here and at the ballpark. BTW – awesome homerun tonight (438 ft, if you didn’t already know) and you gave a great interview too. Just wanted to say that I’m a big Dodger fan as well as a big fan of yours as well!! Great blog! I’m in San Diego, but I’ll make sure to try Shabu Hachi next time I’m in LA for a Dodger game!! You guys are doing great and us fans are behind you all the way!! A little something from the ITD blog. You’re a big favorite over there. Sung to Centerfield by John Fogerty. ITD chicks swoon, there’s Andre on the field. It’s a brown eyed handsome man. Anyone can understand the way our Nelly feels. Oh, play Andre Joe, He’s ready to play, everyday. Put Andre in Joe, He’s ready to play, everyday. Look at Dre’, He can be left field. Well, he spent his time, in the Phew line. Watchin’ it from the bench. You know he should have played as he watched the Cow strike out. So play Dre’ Torre, sit Andruw Jones and Slappy Juan Phewerre. Don’t say he don’t hit lefties, you know it just ain’t true. Yeah, Dre’s got it, he’s got it!! Got some beat up vets, a strike out Cow, and a weak armed Slappy Phew. You know I think its time to give the kids a try. Then JoJo sits his buns. (Pop) It’s gone and you should kiss Cow’an Phew goodbye. Well keep up thee good workk! you might like Chosun Galbi on Olympic Blvd. in Koreatown. it has many of the things you like – good beef, do-it-yourself cooking for hot food and at your own pace, spicy appetizers, and a good environment. keep up the good play on the field and i’ll forward to more of your restaurant reviews. I’ve known Taka for a while now from going to Dodger games (after the Mets Knocked us out 2 years ago a few of us went with Taka after hours to eat Shabu, drink Beer, and “wait til next year” chat). Taka always talks about Shabu Power, and it looks like you’re a believer now from the way you’re hitting the ball! 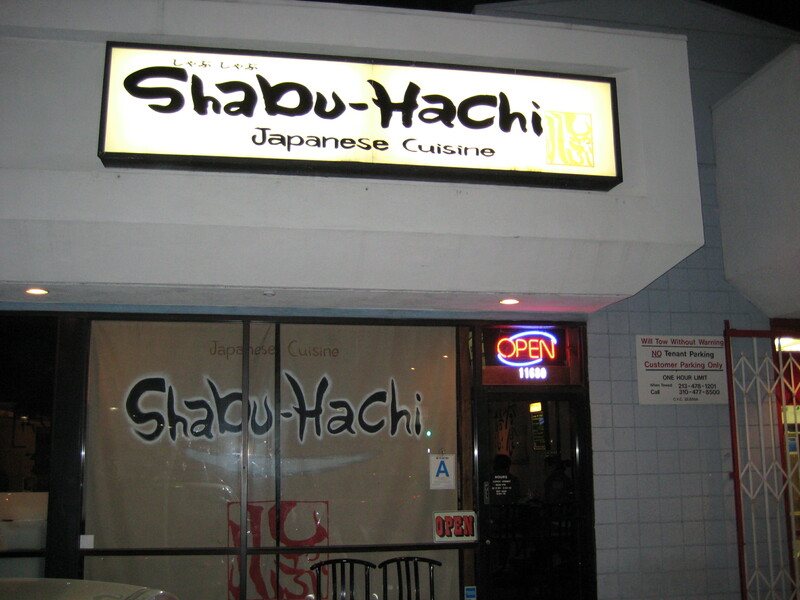 Excellent, glad Shabu Hachi is getting the nod from Dodger Right Field, we’ll see you there. Having been raised by Japanese grandparents, I enjoy good, authentic Japanese cooking. I now live in Las Vegas, but try and get to as many Dodger games as I can. My favorite Japanese Restaurant in Aoi located on 1st Street in Little Tokyo. It is a small place owned by a humble little couple from Japan that do most of the cooking and serving. Try it sometime, or better yet my 11 year old son and I will be glad to treat you and Takashi “Sammy” Saito the next time we are in LA. Thanks Andre for the great role model that you are for all of the kids. Oh yea, one last thing Aoi in Japanese means Blue; keeping with the Dodger Spirit! “In my brief couple years that I have spent in Los Angeles,…” Well. You did have a great time in Los Angeles right? I only like Las Ve Gas. That is good place to visit.